A four-year-old boy who was mauled by a dog in Flintshire earlier this week is recuperating at home. North Wales Police say they are continuing their investigations into the attack in Holywell on Tuesday. Thomas Miles, who is partially sighted, may need plastic surgery after the attack by the dog, which is thought to have been a Rhodesian Ridgeback. Thomas' father, who is also partially sighted, and an off-duty policeman were also injured in the incident. Thomas' aunt, Caroline Miles, said they were concerned how the experience would affect her nephew. "We're all worried now that, with his eyesight, he'll be too scared to go out," she said. "People need to learn to keep their animals under control." 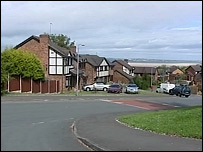 Miss Miles said that Thomas had been savaged "like he was a doll" in the attack on the Tan y Felin estate in Greenfield. "[The dog] grabbed Thomas and caught him on the inside of his right leg. "It picked him up and ran down the street with him, Thomas's head was bashed on the pavement." "[Thomas's father Steven] said he was punching, kicking and trying to gouge the dog's eyes." She said Mr Miles, a single father, ran to the nearest house where off-duty police officer Tony Jones, 38, opened the door and let them in, before trying to deal with the dog himself. 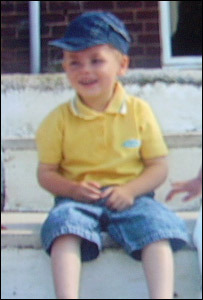 Thomas was taken to Glan Clwyd Hospital in Bodelwyddan by ambulance where he underwent emergency surgery. The dog was later destroyed and tests are underway to confirm its breed. North Wales Police said preliminary inquiries suggested the dog was not of a breed banned under the 1991 Dangerous Dogs Act.